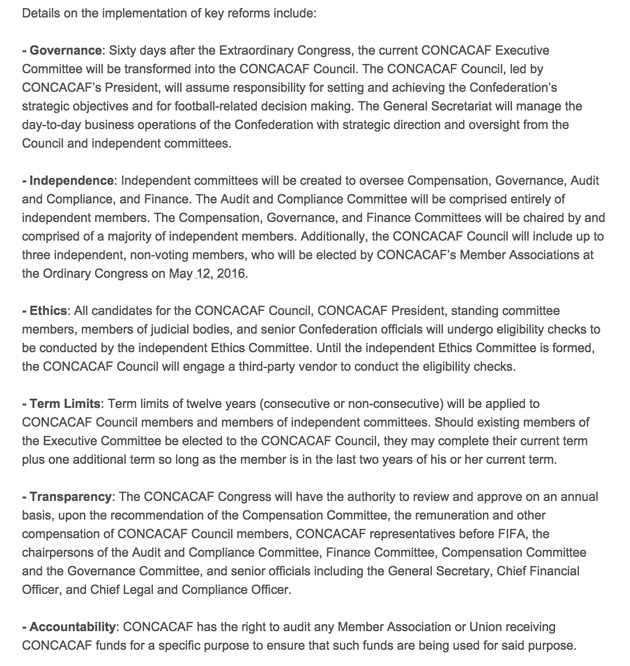 CONCACAF, soccer’s governing body for North America, Central America and the Caribbean, announced Thursday that it has introduced a number of reforms that will become effective immediately. CONCACAF, soccer’s governing body for North America, Central America and the Caribbean, announced Thursday that it had unanimously passed reforms that will become effective immediately. All 41 member countries of the organization voted in favor of the reforms, which affect governance, independence, ethics, term limits, transparency and accountability. FIFA will undergo a similar vote tomorrow that would introduce a number of reforms to soccer’s international governing body. Both CONCACAF and FIFA have been the subject of recent corruption investigations. Numerous CONCACAF officials have been indicted in the United States, including three former organization presidents.